It seems hard to believe, when you look back on it, that Harry Sullivan was originally only going to be in Doctor Who for a single series. 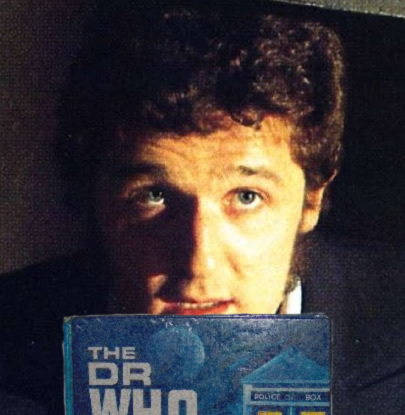 Harry – played to perfection by Ian Marter – is one of the show’s most beloved companions, faithful and steadfast, if prone to occasional bouts of stupidity. Despite earning the Doctor’s wrath on more than one occasion, his sense of pluck, resolve and loyalty never wavered throughout his two years in the TARDIS, from that first appearance as the newly-regenerated Doctor’s physician in Robot to that eloquent farewell in the closing moments of The Seeds Of Doom. It’s impossible to imagine the likes of Planet of Evil or Pyramids of Mars without him, and yet it came so close to not happening, – because, as is well-documented, Harry very nearly jumped ship after his encounter with the Zygons. According to a popular urban legend, the original decision to dispense with Harry was made purely on the basis that the character felt redundant. Tom Baker was not the older man the creative team had initially envisaged casting, and was able to do most of his own stunts; hence the need for a younger man to handle the action sequences (Terrance Dicks pithily refers to this construct to as ‘The Muscle of Russell’) was eradicated overnight, and it was felt that three was a crowd, at least in the TARDIS. It’s a reasonable theory, but it couldn’t be further from the truth – as Dicks himself would later attest. 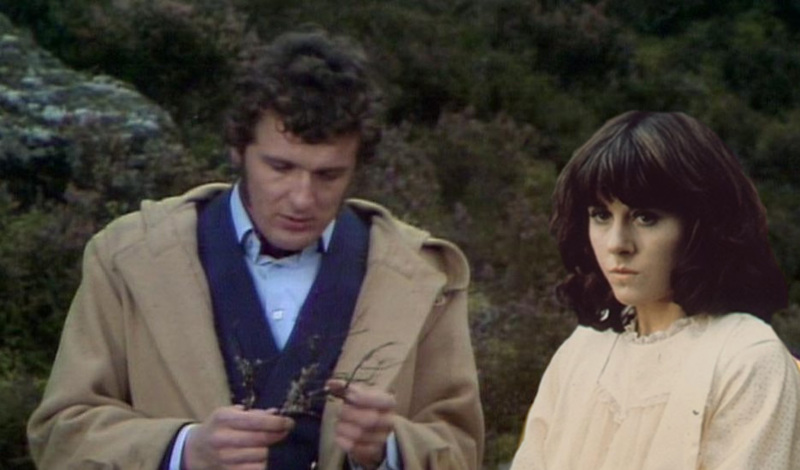 Harry and Sarah Jane Smith in a scene from Pyramids of Mars. The decision to retain Harry beyond his original point of departure – the final episode of Terror of the Zygons – was comparatively last-minute, and led to some hasty rewriting. Some of this is more obvious than others. Certain scenes, for instance, are on the verge of lapsing into cliche when it is clear that Harry has nothing to add to a conversation that was originally supposed to take place between only two characters – as this extract from Seeds of Doom proves in abundance. HARRY: Yes, what does it do? DOCTOR: I suppose you could call it a galactic weed, except it’s deadlier than any weed you know. HARRY: Yes, in what way? DOCTOR: Well, on most planets, the animals eat the vegetation, hmm? DOCTOR: On planets where the Krynoid gets established, the vegetation eats the animals. HARRY: It’s more than that, it’s petrifying. DOCTOR: Oh, shut up, Harry. Other changes are more complicated, but pruning the narrative tree can bear unexpected fruit, The Android Invasion being perhaps the best known example. In the original script, Sarah Jane was supposed to come across an android version of Harry, but after rewrites the the character was changed to the Brigadier, in what would be the final 1970s appearance for Nicholas Courtney – and setting the stage for an anecdote on which he would dine out for many years afterwards. While some of the rewriting passed without incident, there were other stories in which the affable lieutenant simply didn’t fit, and thus the decision was made to temporarily remove him from the action – with often comic results. 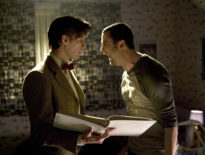 In Pyramids of Mars, for example, Harry spends the first two episodes locked in the TARDIS lavatory, where he passes the time by reading a particular book that led to one of the most infamous fourth wall-breaking moments in the show’s history. Harry whiles away the hours in the TARDIS WC. 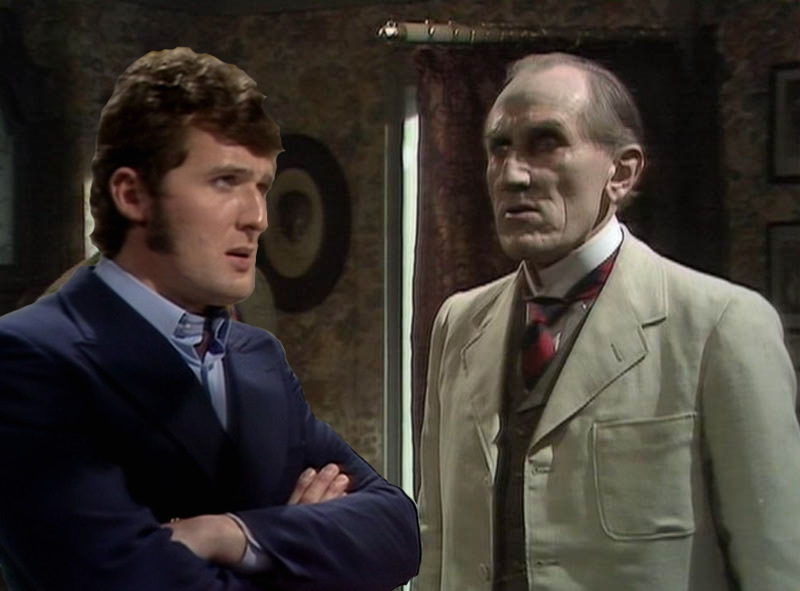 According to a leaked internal memo, BBC bosses lambasted Philip Hinchcliffe, adding that it was “a bloody good thing Points of View is on hiatus”. Ah yes, that one. 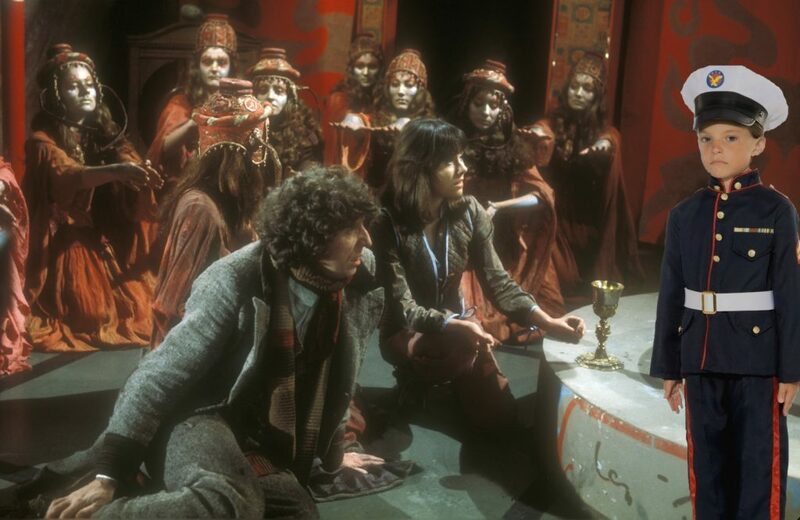 Hinchcliffe refers – as if anyone needed reminding – to the moment in The Brain of Morbius where Harry stumbles into the Sacred Flame and instantly regresses to childhood, much to the Doctor’s amusement. The three episodes in which he features have passed into Doctor Who production lore, with many behind-the-scenes rumours still unconfirmed thanks to the terms of several superinjunctions – and despite Hinchcliffe’s reassurances that the change was transient from the outset. The infamous moment Young Harry steps out of the flames in The Brain of Morbius. And what of the rumours behind Robin Leopold-Agnew, the thirteen-year-old stage school prodigy chosen to play Harry’s teenage self? It’s something that’s generally off limits to journalists, largely because when you ask anyone about it the results tend to be unprintable. Certainly the rumours about Leopold-Agnew’s on-set behaviour – including the notorious Mushroom Soup Incident, terminology which has acquired the sort of legendary status to rival Jump The Shark – put a dampener on the character, and cast and crew alike were relieved when Marter returned for what remained of his final story. 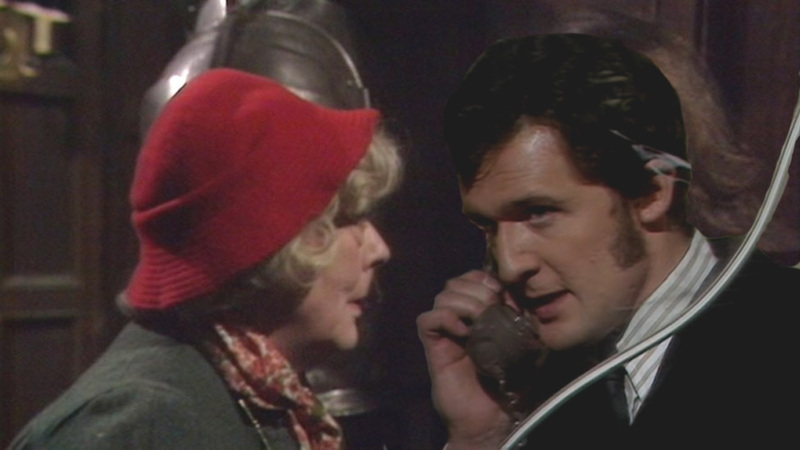 The Seeds of Doom: Harry’s intense phone conversation with UNIT as Amelia Ducat (Sylvia Coleridge) attempts to listen in. In the event, of course, Harry drove off into the sunset – quite literally – with Amelia Ducat, having been enlisted as her personal chauffeur. It seemed an obviously mundane exit for a character who was happier with his feet on the ground, and given that this was the last time we would see Harry on screen – Marter’s untimely death in 1986 putting paid to any further appearances – it was a fitting send-off. That conversation – the memorable “tea and scones and buttered toast” monologue – is so famous it doesn’t need reprinting here, but it had so much impact on Roberts that he would eventually go on to pay homage to Seeds with his own episode, 2008’s Plant Life. 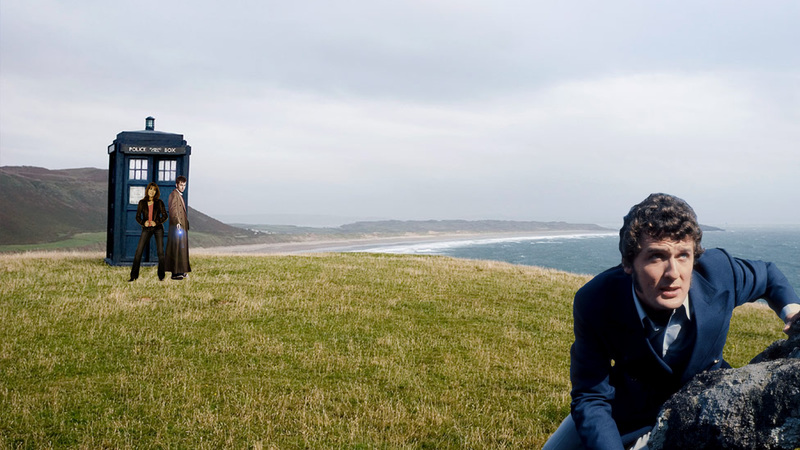 Two scenes from Plant Life (2008): Top – the Doctor, Sarah Jane and Scorby face off against the terror that Scorby has unleashed. 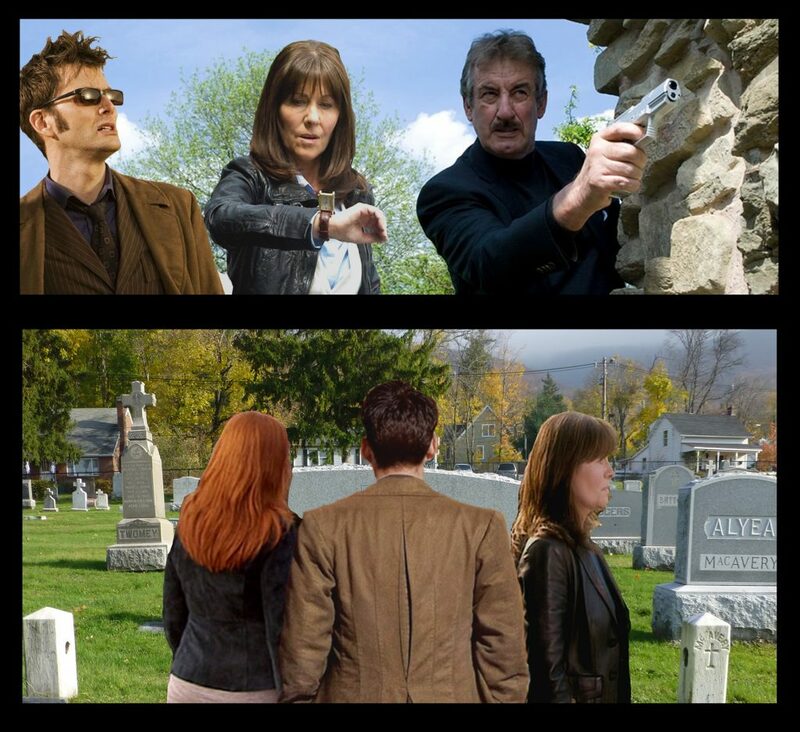 Bottom – the Doctor, Donna and Sarah Jane gather to pay their respects to a former comrade. We mine a well-worn cliché – not to mention a dangerous misstep – when we suggest that we should be living our lives like the Doctor, but this is probably one of those times when it’s not a bad aspiration.